Sriharikota: Indian Space agency ISRO’s Polar Satellite Vehicle (PSLV), in its 45th flight PSLV-C43, blasted off here today (29 November 2018) carrying India’s earth observation satellite HysIS along with 30 more satellites from eight other countries. The 28-hour countdown for the launch began at 5.58 AM on Wednesday and the rocket blasted off at 9.58 am Thursday from the Satish Dhawan Space Centre (SDSC) SHAR at Sriharikota in Andhra Pradesh, about 110 km from Chennai, the space agency said. This is the 13th mission using PSLV-Core Alone variant. 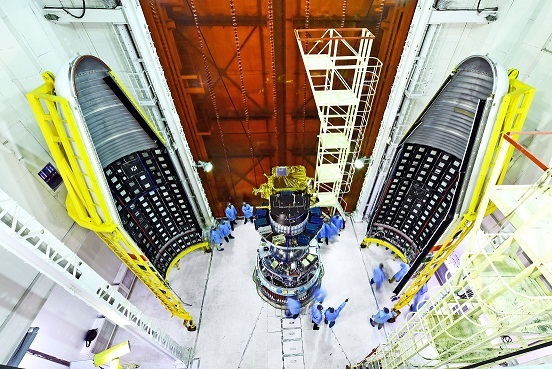 The primary satellite HysIS will be placed in 636 km polar Sun Synchronous Orbit (SSO) and the co-passenger satellites will be placed in 504 km polar SSO after restarting the fourth stage of PSLV (PS4) engines twice. The primary goal of HysIS is to study the earth’s surface in visible, near infrared ad shortwave infrared regions of the electormagnetic spectrum. The co-passengers of HysIS include 1 Micro and 29 Nano satellites from 8 different countries. All these satellites will be placed in a 504 km orbit by PSLV-C43. These satellites have been commercially contracted for launch through Antrix Corporation Limited, the commercial arm of ISRO. PSLV is the third generation launch vehicle of India. The vehicle is designed to place remote sensing satellites in polar SSO. It can carry up to 1,750 kg of payload into SSO of 600 km altitude. Additionally, PSLV has been used to launch planetary missions and also satellites into Geosynchronous Transfer Orbit.